Be afraid. Be very afraid. 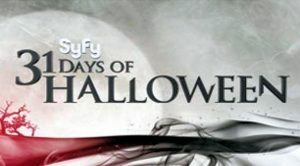 Syfy’s 8th annual 31 DAYS OF HALLOWEEN spook-a-thon will unleash more than 600 hours of blood-curdling programming October 1-31st 2015, including ghoulish Ghost Hunters and Paranormal Witness holiday-themed episodes and four spooky new original movies.